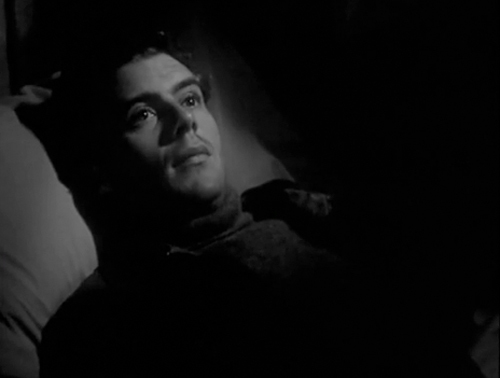 I continued my discovery of Dirk Bogarde last night with "Hunted" (1952) (available on YouTube here) Ten years ago when I first started liking classic film, I kept a little diary where I would write down the names of my favorite stars. If I saw them in one film and found them impressive, I'd scribble their name down in the book, with one tally mark representing how many films of theirs I had seen. Only when it reached three tally marks (three films) could that person be an "official" favorite. (I was 13, okay?!) It may seem really silly now, but I wanted to make sure that the one performance wasn't a fluke-- this person was really good! Well "Hunted" is now my third Dirk Bogarde film. While I don't keep to that same rigid formula for choosing my favorite actors anymore, there's still a part of me that thought, after watching this film last night, that Dirk Bogarde is now an "official" favorite. 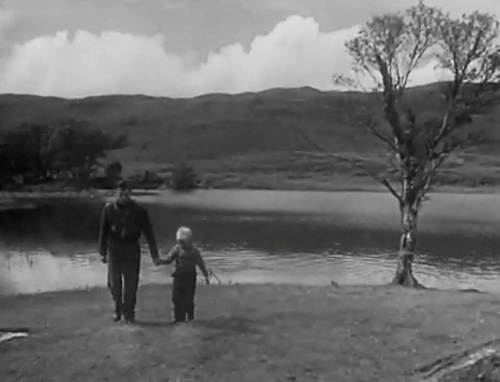 The film starts off with a little boy (Jon Whiteley) running away from a burning house. 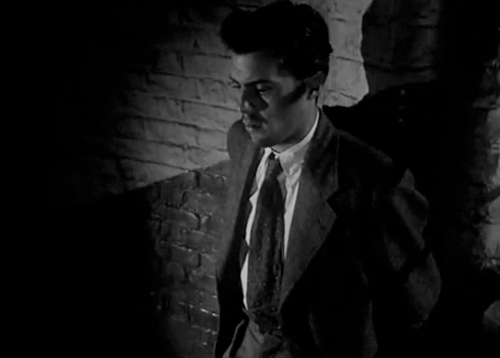 He runs into an abandonded basement and finds Dirk Bogarde standing next to a dead body. Dirk Bogarde abducts the boy and sets out on the lamb. The film is very dark and definitely has that distinct British post-war cynicysim. But it's also incredibly touching. The little boy is an orphan, abused by his adoptive father. Dirk is a sailor with an unfaithful wife and a family that cares more about keeping up appearances than his own well being. Both neglected and hurt, the two forge an unlikely bond throughout the course of the film. I really love movies that show the human side of people who commit crimes. Too often a murderer or thief is portrayed in a completely evil light, with no reason, conscience or feeling. In this film, we see how Dirk Bogarde's character was led to commit his crime because of circumstances and environment, because of pride and honor. At heart, he is really a softy who just wanted a fairy-tale sort of life with the woman he loved. The most touching scene in the film takes place about 30 minutes in. 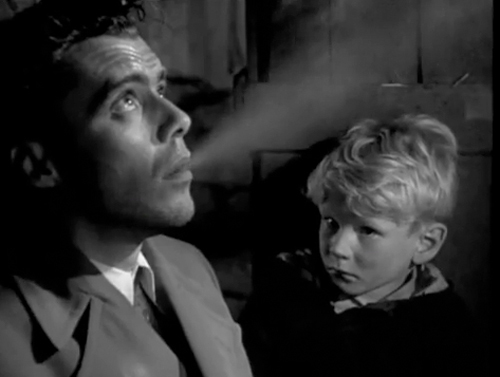 Dirk Bogarde and the kid are getting ready to go to sleep and the kid asks for a bedtime story. Reluctantly, Dirk Bogarde starts off telling a silly fairy tale. But once he brings up the princess, in his eyes you can see that he's thinking about his wife. The fictional story slowly turns into his own biography; about his wife's betrayal and the events leading up to the murder. It's heartwrenching to watch him, as his face slowly gets twisted from thinking about his crime. 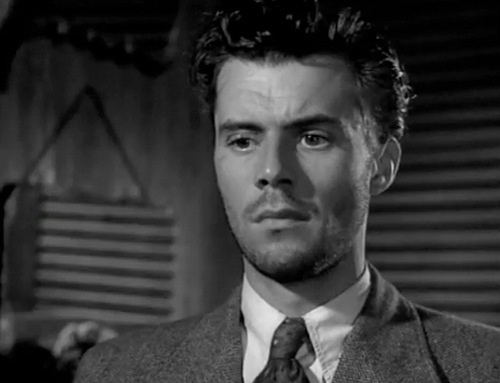 I don't see this too often in movies, but Dirk Bogarde really mastered the technique of thinking on film. It's almost all in the eyes, too. If you watch the film on youtube, look out for the scenes when he's listening for footsteps, or trying to hide without being seen. In these scenes especially you can see his thought processes in his eyes - you can see the fear etched in his face. It's incredible! Hope you guys don't mind me documenting my Dirk Bogarde adventures, I'm just so excited about discovering his films that I feel almost compelled to write about each one! wow, I'm drawn in just by the screen shots, and your writing sealed it! What a great review! You really got me interested in a film I never heard about! Thank God YouTube exist for us who can't get to see pictures like these in many other ways. I will look it up! What an interesting post! His thoughts on acting are quite insightful. Nicole- It was really good, I think you'd like it! I'm thrilled to discover someone new, I really don't know how I missed him all these years! Vivienne- Let me know when you watch it!! Merriam- Thanks. They are, I really want to get his books now. You have a real talent for appreciating actors and putting the finger on the pulse of their methods. It is incredible!